If you’ve read much of my writing here at Macworld, you know I love using the keyboard as much as possible. I find that reaching for the mouse (or trackpad, as much as I love mine) slows me down and interrupts my flow. If you’d like to use the keyboard more and the mouse less, here are some ways to do just that—and some advice on how to manage your growing collection of keyboard shortcuts. OS X includes a number of global keyboard shortcuts that you may already be familiar with: Hide and unhide the Dock (Command-Option-D), activate Spotlight’s menu bar drop-down (Command-Space), take a screenshot (Shift-Command-3), and show Mission Control (Control-Up Arrow). What you may not know is that these shortcuts are customizable, and that you can assign shortcuts to other system-wide actions. To customize the existing shortcuts, or to add more, open the Keyboard panel in System Preferences, and click on the Keyboard Shortcuts tab. Choose a category in the left-hand pane, and the associated tasks show up on the right. Changing an existing shortcut is as simple as clicking on the displayed keystrokes, then typing your own replacement. It’s similarly simple to create a new keyboard shortcut; click on the light-gray None, and hit your combination of keys. You can easily add your own keyboard shortcuts to often-used commands that lack them. 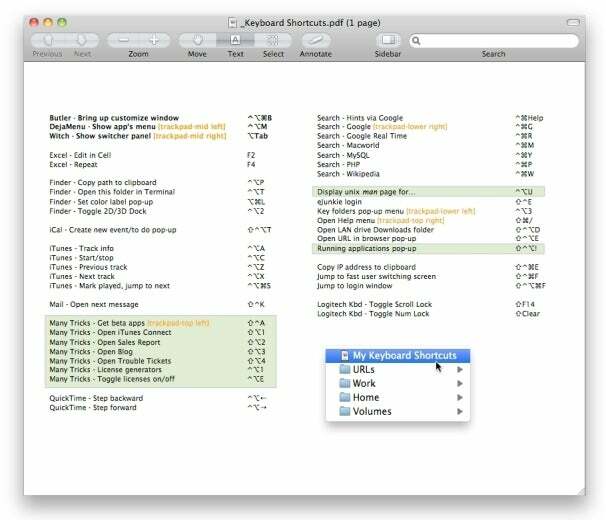 The Keyboard tab is also where you can create application-specific keyboard shortcuts. Why might you want those? Consider Mail, where I use a lot of reguar and smart mailboxes to organize my ever-growing collection of email. Unfortunately, Mail doesn’t have keyboard shortcuts for things like creating new mailboxes. But it's simple to add shortcuts for the menu items I use most: Back in the Keyboard pane of System Preferences, click on Application Shortcuts in the left-hand side of the Keyboard tab, then click the Add button (+) to add a new shortcut. A new window will open. 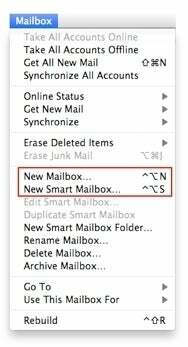 When it does, select Mail (in this example) in the first pop-up, enter the exact name of the menu command in the next box (you can type the “…” by pressing Option-;), and finally, the keyboard shortcut you’d like to create. Repeat as necessary, and when you’re done, you’ll find your new shortcuts in the app’s menus ready to go. While you can assign your own shortcuts in most (but not all) applications, you may find that certain menu commands refuse to cooperate. Unfortunately, there’s no rule for determining which ones will work and what won't; just give it a try and see what happens. Another way to keep your hands on the keyboard is through the use of launcher utilities such as Alfred ( ), Butler ( ), LaunchBar ( ), or Quicksilver ( ); and via keyboard macro programs such as Keyboard Maestro ( )or QuicKeys ( ). (Disclaimer: I now work for the company that makes Butler.) All of these programs have a powerful mix of features, some of which include the ability to assign keyboard shortcuts. One downside to being keyboard-centric is the sheer number of keyboard shortcuts that exist. Consider Mail’s menus, for instance: I count 89 defined keyboard shortcuts in just that one app. Add in the shortcuts for your other apps, as well as those you've created yourself, and you could have literally thousands of keyboard combinations to remember. How could you possibly remember them all? The honest answer is that you can’t, so you shouldn't even try. Instead, you should memorize just those you use most often, use some other aids to help you recall the ones you don't use quite as often, and then rely on even more help for those you rarely use. The first level, your most-used shortcuts, is the easiest: You naturally memorize them through sheer repetition. For me, this isn’t a huge list; maybe five to ten key shortcuts per app. KeyCue can’t, however, help you with shortcuts you may have created using a launcher or keyboard macro program. Because that’s how I’ve created many of my most-useful shortcuts, I came up with an alternative solution: I created a new document in Pages, listing these essential shortcuts, and what each does. I then saved that page as a PDF (because Preview opens much more quickly than does Pages). The pop-up menu I use to open my shortcut cheat-sheet (lower right) and the actual sheet itself. To make sure I can always get to my shortcut cheat-sheet quickly, I created a menu using Butler (which I summon with—you guessed it—a keyboard shortcut) and then assigned a touchpad gesture to “type” that shortcut for me using BetterTouchTool. With this solution in place, I can either summon the Butler menu with its shortcut or a tap on the lower left corner of my Magic Trackpad to pop up a menu whose first item opens my shortcuts sheet. Once I’ve looked up a shortcut on that sheet, I'll remember it for a little while, so I don't have to refer to it constantly. For those shortcuts you rarely use, here’s one last tip, though it’s only useful for key-combinations that are in a program’s menus: Use Shift-Command-/, the global shortcut for the Help menu in nearly every OS X application. Even if I don’t remember the shortcut key for a particular command, I can usually remember the command's name. So after activating the Help menu from the keyboard, I can start typing that name. Help then searches the app's menus for commands that match what I've typed. As it finds commands, it also shows their keyboard shortcuts. Obviously, you don’t have to use this trick only to find shortcuts for the commands you want. You can just as easily search for a command, then use the cursor arrows to navigate to the one you want. Press Return, and the command will be implemented.